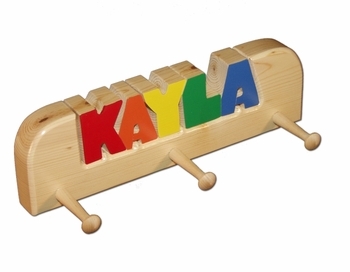 Made from solid wood, it�s a charming yet practical remembrance that will be appreciated during the years to come. It makes a cute gift for newborns, a first birthday and holidays. The puzzle pieces familiarize the child with his or her name and assist them in reading. 8 letters maximum. Size: 4 1/2" x 15" x 1 1/2" Item comes with everything necessary to hang on the wall. NOTE: The "No Knots Option" allows you to limit any knots in the wood to the sides of the rack only - an additional $15.00.